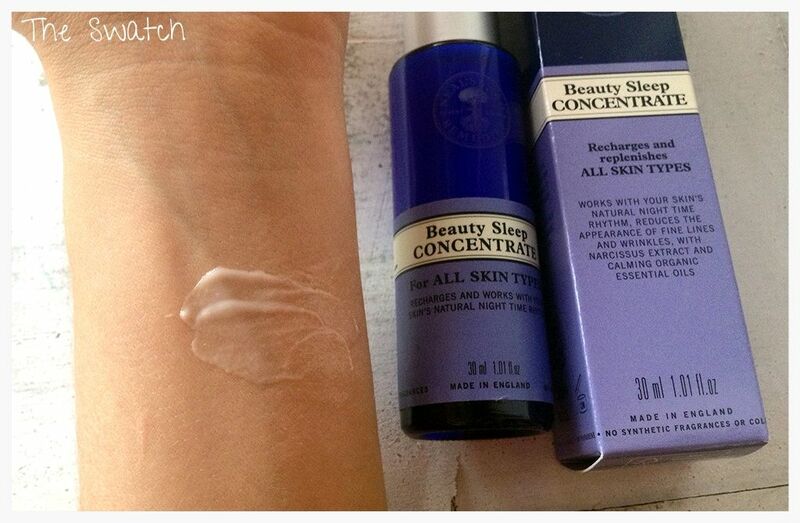 Today's post is going to be about The Neal's Yard Beauty Sleep Concentrate. Neal's Yard is a skincare brand that specialises in cruelty free, ethical and safe skincare. Neal's Yard really are quite firm when it comes to their safe approach to skincare, which you can see for yourself here - I think its great when skincare brands really put effort into ensuring that their products are the very best they can be. Its very easy and tempting for brands to load their products with cheap "safe" Chemicals, but when a brand really goes that extra mile to ensure that the end product is really safe it gives me faith to use and trust the brand. Theres even a little story behind the Neal's Yard Blue Bottles, as they are made in the UK and fired from scottish sand and soda ash from Cheshire in line with the brands CarbonNeutral status. I honestly couldn't believe how interesting the Neal's Yard website was when I first started researching, and I can tell you its well worth the read. 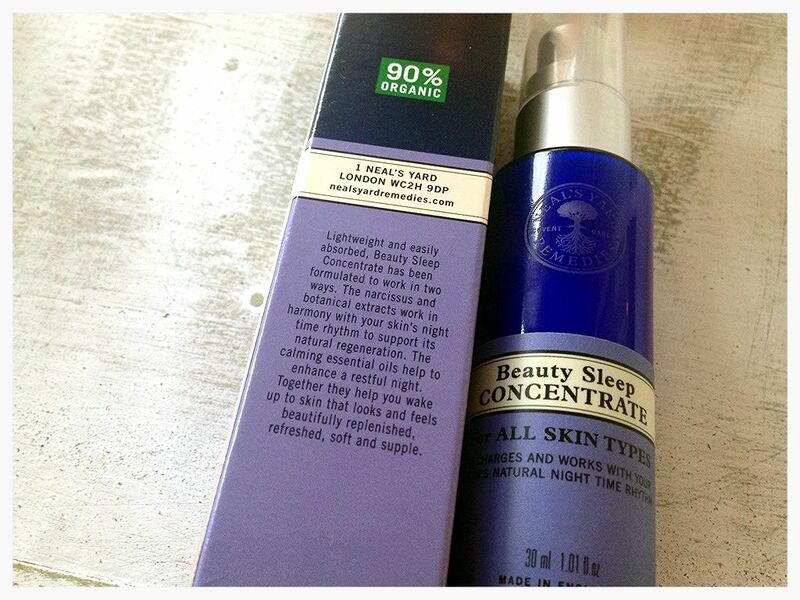 My sister very kindly gave me the Neal's Yard Beauty Sleep Concentrate as a gift which retails for £31.50 and I have been really loving trying out a new brand with such good values. I'm a complete skincare geek and recently I have been really getting into trying new products, plus I work for one of the best skincare brands in the world Elemis who are another fantastic and ethical skincare brand, and I'm sure you have seen me rave about them before. 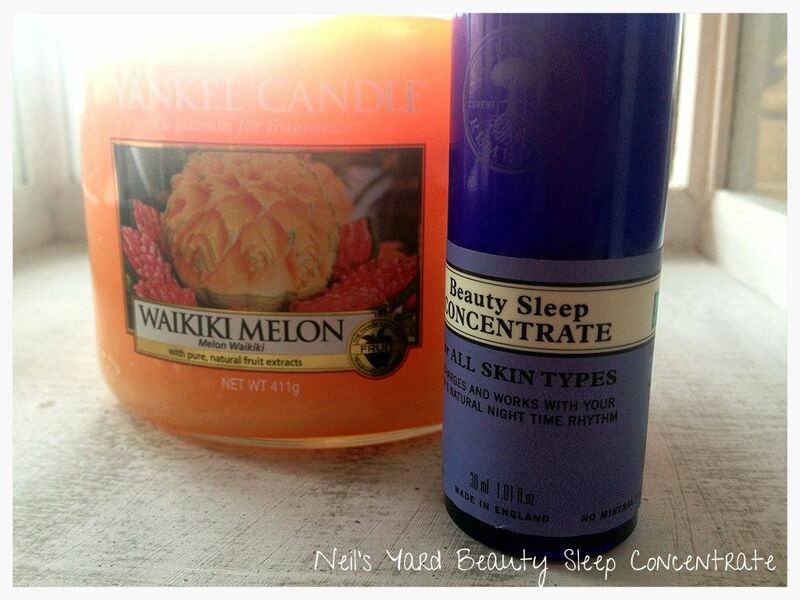 However, I was so intrigued by the Beauty Sleep Concentrate, as it sounded right up my street.. I mean who doesn't want beauty sleep in a bottle haha ? - I hope you enjoy my review sweeties! and I'm always free for skincare advice, so you can either tweet me, or leave me a message in the comments section below. PROVEN IN CLINICAL TRIALS TO INCREASE SKIN'S MOISTURE LEVELS BY UP TO 98% OVER 12 HOURS.Infused with naturally regenerative narcissus tazetta bulb extract, a smoothing tri-peptide and antioxidant-rich nourishing grape seed oil, for skin that looks and feels beautifully moisturised, replenished and recharged. With a delightful blend of aromatherapy essential oils renowned for their calming, relaxing properties. I have been testing this out for just over a week now and I'm actually beyond amazed with this product. It's a lovely thick (ish) serum that has a really unusal scent not like your typical lavander/camomile scent used for bed time serums/remedies. It actually smells quite spicey, but this might be down to the ylang ylang and patchouli within the ingredients. Ylang Ylang is also very well known for calming and balancing the mind, which really helps make it a soothing nightime remedy. Patchouli is also fantastic for mood enhancing, as well as treating anxiety and depression. However, I don't want to promise these kind of results for everyone, as we are all different... but in terms of its claims of being a sleep enhancing night serum I would 100% agree. It leaves your skin looking completely rejuvenated in the morning, which is amazing! I have been waking up looking half alive! so thats a huge bonus haha. It's also really suitable for all skin-types and it hasn't left my combination skin oily in the slightest. It's still early days with this product but just over a week of perfect sleep and rejuvenated has left me feeling pretty good. The combination of aromatherapy and skincare benefits makes this product the perfect night time treat, and I really look forward to using it at night. I hope you have enjoyed this review lovelies! I would really love to know what you think about this? - Would you give it a try ? - I appreciate every single one of my followers and really love hearing from you! also feel free to leave your links in the comments section below. This could be magic in a bottle, I'd definitely like something like this in my routine :) I too suffer come bed time as I just cannot settle at all, always thinking of something. India, how have you been? How are you getting on with that sheer glow? This concentrate looks amazing, I think I'm going to have to try this! Neal's Yard stuff is great! And that Yankee Candle looks like it would smell amazing too! ahah!